Land and water planners frequently wrestle with the problems of uncontrolled growth and sprawl and their deleterious impacts on water quality. Fortunately, tools such as watershed management and impervious cover thresholds are available to address these problems. Researchers with the Water Resources Agency at the University of Delaware, Institute for Public Administration recommends an approach to protect water supplies and contain sprawl in Delaware through land use planning based on natural hydrogeological boundaries – the watersheds. Impervious cover thresholds can be used to focus growth into watershed zoning districts where development would have the least impact on stream water quality. Since 1991, impervious cover thresholds have been employed within the New Castle County, Delaware zoning code to protect sensitive water resource protection areas during new development. 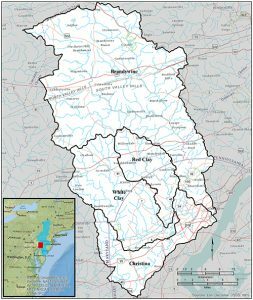 The authors advocate amending the existing code to establish watershed-zoning districts based on percent impervious cover thresholds in the Christina River Basin of Delaware. By employing this concept in county and municipal zoning codes, smart growth can be concentrated in areas with existing infrastructure, while protecting the quantity and quality of Delaware's surface water supplies. Land use zoning based on impervious surface coverage should be considered as an effective, measurable, and scientifically defensible technique to protect stream water quality in the Christina River Basin and other watersheds in the Delaware Valley, the USA, and overseas. This manuscript is part of an ongoing watershed-based program in the Christina River Basin of Delaware and Pennsylvania to protect and improve the quality of the streams that provide 75 percent of the water supply for residents of New Castle County, Delaware. The Water Resources Agency provides regional water resources assistance to state and local governments in Delaware and the Delaware Valley in its education, research, and service role at the University of Delaware. Please address comments to Dr. Kauffman at jerryk@udel.edu.